Thermocouple Cables are the same as Instrumentation Cables. They both are used for process temperature measurement. The manufacturing process of these cables is similar to Relemac's paired instrumentation cable with the difference being in the conductor material. Thermocouple Cables are used in a wide variety of processes to sense temperature. Thermocouple Cables are used to connect control surfaces to the pyrometers, enabling accurate temperature indication and control. The Thermocouple Cables can be purchased in bulk from us. We are counted amid the trusted Thermocouple Cable Suppliers in India. Thermocouples and pyrometers are electrically conducted by the thermocouple extension/compensating cables. It is essential that the cabling uses the same conductive material as the thermocouple itself. This is to ensure similar thermo-electric (e.m.f) properties as that of the thermocouple used for sensing the temperature. If there is not a match in thermo-electric properties between the cable and the thermocoupling accurate temperature measurement will not be possible.That is why Relemac puts such stringent quality control measures into their design and manufacturing processes. Our thermocouple cables are manufactured using the following standards:- IS: 8784, ANSI-MC 96. 1, B.S., IEC, JIS, ENI, DIN .Thermocouple cables can also be manufactured according to customer specifications for custom applications if none of our stock cable meets the desired criteria. Different thermocouple types, for the reasons above, require different types of alloy wire combinations. Some of the most popular thermocouple wire and cable types are listed below, but custom cables can be configured to fit the customer's exact needs. Connecting cables that allow communication between thermocouples and temperature sensors or other processing equipment are divided into two types of cable, compensating cables and extension cables. These can have a solid or stranded conductor; this will depend on the exact application and the required conductor material and the thermo-electric properties of the thermocouple that is being attached to the processing instruments. Extension cables are used for these critical conditions, and the conductors must be made of the same material as the thermocouple. This is to ensure that extension cables are operating within the same accuracy limits as the connected thermocouple. Extension cables are marked with an X behind the identification letter for the thermocouple, so a type K thermocouple would require a thermocouple extension wire marked 'KX', indicating a conductor material of (NiCr-Ni). Compensating cables achieve similar thermo-electric properties through other means than matching the conductive material to the thermocouple exactly. Using conductors made of the proper combination of materials allows compensating cables to match the thermo-electric properties as long as the temperature range stays within a limited set of parameters. 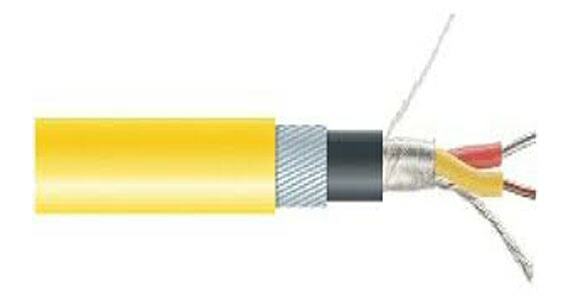 This type of cable can be less expensive than the thermocouple extension cables, which must use the same material as the thermocouple for its conductor material. Compensating cables are marked with the letter 'C' behind the thermocouple type; therefore a 'K' thermocouple would be marked 'KC'. Remember that compensating cables are only accurate to system parameters within the specified temperature range. The insulation of conductors and well as sheaths can be manufactured from a variety of materials, depending upon your exact specifications. Relemac cables, despite being one of the largest cable manufacturers on earth can seamlessly match your needs to a specially designed cable that will fit your specifications exactly. Insulation Code Insulation Apperance of Thermocouple Grade Wire Temperature Range Insulation Abrasion Resistance Flexibility Water Submirsion Resistance To. The following criteria must be taken into consideration when selecting the appropriate material: chemical and mechanical resistance against the ambient conditions, temperature range, insulation resistance, flexibility, outside diameter, screening etc. Apart from that there is a great number of cable types available as compensating cables or extension cables as well as those with more than two inner conductors. In most applications, thermocouple cables are connected to other processing instruments via connecting cables, which are then further subdivided into compensating cables and extension cables. The compensating and extension cables can also have several different configurations, such as stranded or solid conductors and different types of insulating and sheathing materials. This will depend upon your application. • Cryogenics, HVAC, automotive, food processing plants, appliances, sensors... and more.